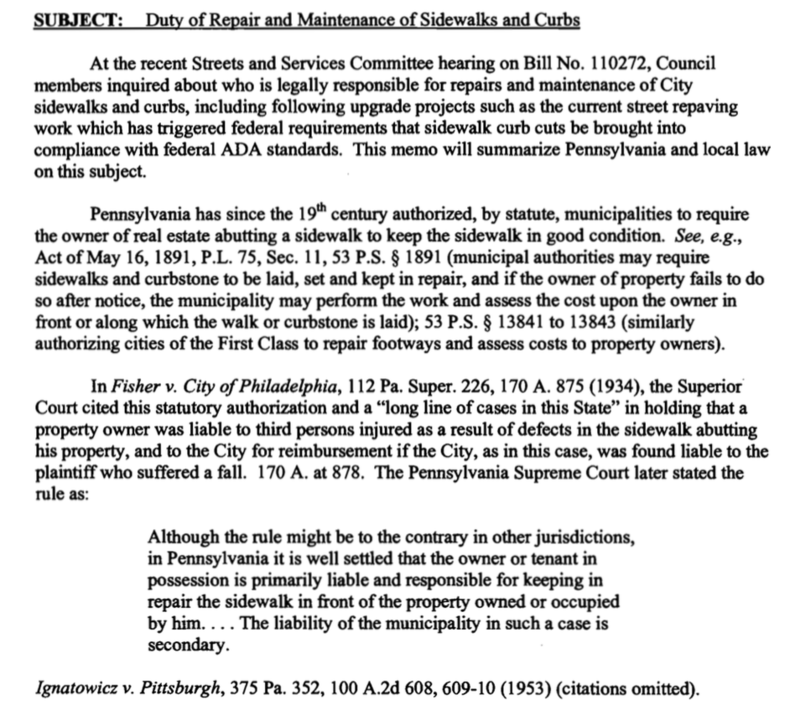 I would like to thank the mayor of Jenkintown, Ed Foley, for sending me a document that pertains to this commonwealth’s policy on sidewalk repair. Make no mistake folks: This goes back decades, and it does seem to have everything to do with shifting liability from municipalities to its citizens property owners. You trip over a crack on the walkway in front of my house, I have to pay your hospital bills. This isn’t how it goes in my home state of Massachusetts. As I understand it, if I do not properly clear my walkway after, a snow storm, or I leave something in the path, I assume the liability. The property owner is responsible for keeping the pathway clear. However, if the walkway crumbles, and you step in a hole, the city is liable. And what do you know? The same principle applies to the roads. As I preface many conversations, I’m not a lawyer, but this law seems to allow towns to place responsibility upon property owners, but it does not require it. If Jenkintown wants to pay for its sidewalks, I’m not yet seeing anything that precludes it from doing so.